What do Eleanor Roosevelt, David Bowie, Sir Alec Guinness, Angela Rippon, Dame Edna Everage, Sir Peter Ustinov, Wilfred Pickles, Jacqueline du Pré, Basil Rathbone, Fernandel, Sophia Loren, Zero Mostel, Boris Karloff, and “Weird Al” Yankovic all have in common? They have each narrated a recording of Peter and the Wolf. Considered by most experts to be a minor composition at best, this unassuming piece is one of the most, if not the most, often recorded classical work. 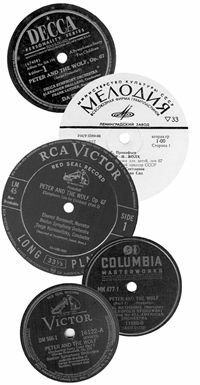 While there might not be more than twenty-five recordings in the catalogue at any one time, over the years there have been over 400 different recordings of varying authenticity in over a dozen languages. Making an exact count is difficult for many reasons. Some versions might share a common orchestral recording by means of overdubbing the different narrations. And some of these un-narrated orchestral beds have been issued on their own. Are all of these one recording or are each to be counted separately? I say the latter. Some recordings change the orchestration, which usually negates the instructional function of the work. Are these to still be included? Of course, but with appropriate notice. Since Prokofiev wrote not only the music but also the script of the story in both the English and Russian languages, if the narrator changes the words is that the same as a conductor changing the musical notes? Perhaps, but even the first recording of the piece took some liberties with Prokofiev’s published script. What if the story has been changed so much that it actually becomes a parody? I still include it. How about adaptations, condensations, excerpts, and even pop songs written from the musical themes? I count each separately unless they were edits from a longer recording. Those are just alternate issues of the original recording. But if you are counting only full-length recordings that use the original orchestration and a reasonably close use of Prokofiev’s original words, then the recordings still number about 300. Record sleeves from the private collection of Michael Biel.